It is with great pleasure that I recommend Ms. Maureen Odoi, founder and executive director of the African Aurora Business Network (AABN) for the One Hundred Woman campaign. Ten years ago Maureen started AABWN, which is an enterprise development NGO headquartered inAccra that assists micro and small scale enterprises (MSEs) and improves the broader business environment through partnerships, capacity-building, creative products and advisory services. Maureen and her team at AABN have expertise in Small and Medium Scale Enterprise Development, Micro Enterprise Development, Agribusiness, Training and Project Management, acquired through engagements with public and private sector institutions, multinationals, development partners and NGOs in Ghana. Through AABN Maureen leads economic empowerment programs for women entrepreneurs, cooperatives and small businesses inGhana, promoting overall economic growth in the country. I have known Maureen for the past year. AABN is a grantee of Vital Voices to implement trainings for women entrepreneurs and associations inGhana, namely the ILO Women Entrepreneur Associations Capacity Building Program, the ILO Women’s Entrepreneurship Development program, and the Vital Voices Supplier Diversity program. In that capacity we worked with her on workshops to train leaders of women entrepreneur associations to build their organizational capacity, support women’s access to business developments services, and increase the participation of women entrepreneurs in the global supply chain. Maureen is an excellent facilitator, organizer, and implementing partner inGhana, and she goes above and beyond the call of duty to help women and youth at the grassroots and community level. Maureen is adept at translating complex ideas into practical concepts and tools for local audiences. I have co-facilitated workshops with her on several occasions and admired her ability to make both urban and rural, formally educated and informally educated participants feel valued and integrated into the process, and foster a collaborative environment that encourages follow-on and continued networking amongst participants beyond the program. She has an extensive network inGhanaamong economic empowerment and gender stakeholders, and is skilled at enlisting their commitment and partnership in new ways. Maureen deserves to be honored because she has worked tirelessly to implement much needed changes in society for the benefit of women entrepreneurs, who are the backbone of the African economy. While she is a great and passionate leader, she is not often in a position to influence public policy or to be heard in places where decisions are made. The recognition would help her to gain the credibility needed to be a stronger advocate for women entrepreneurs. 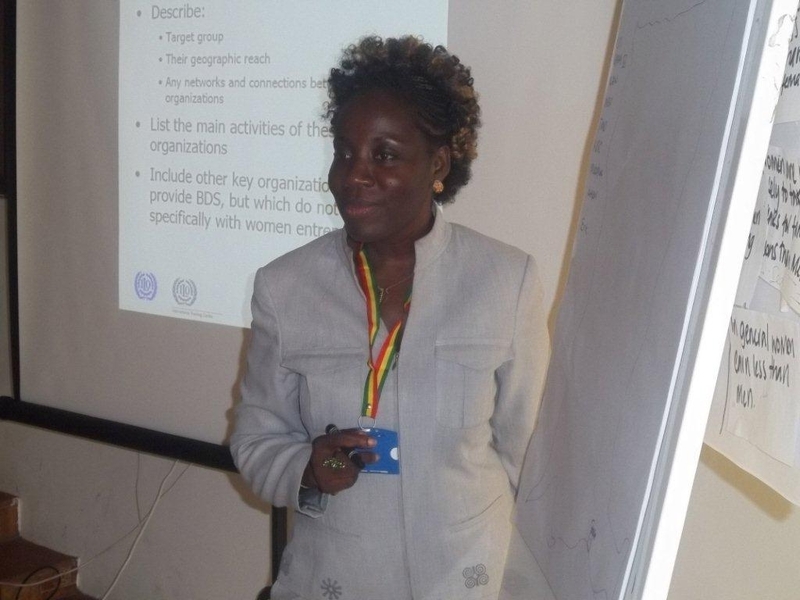 Maureen is known for working collaboratively with others within Ghana and internationally. She is a partner with other women’s economic empowerment organizations within Ghana, including the Eagle Women Empowerment Club (the Ghana Hub of the Africa Businesswomen’s Network), and Maureen also hosts several international volunteers each year, allowing others to gain a full understanding of the practical realities of economic development in Africa. I encourage you to select Maureen as one of the One Hundred Unseen Powerful Women, as it would mean a great deal to her and the women with whom she works in Ghana. hi,am a young lady who is dying to help with female empowerment therefore i would want to set an ngo for that,would love to get in touch with u.plz this is my contact, 0245315154.Thank you.